Diana Gabaldon is the international best-selling and award-winning author of the widely popular Outlander series, a story filled with history, relationships, time travel and a touch of romance. Her first novel, Outlander, received the Rita Award for Best Novel from the Romance Writers of America. There are now 7 books in the Outlander series, with a spin-off series related to one of the main characters, Lord John. The Lord John series contains murder, mystery, and even a little bit of the paranormal. The Outlander saga has sold over 15 million books and is enjoyed worldwide. Matthew Peterson: Hello Everyone. Welcome to The Author Hour: Your Guide to Fantastic Fiction. I’m your host, Matthew Peterson. Last week I interviewed Terry Pratchett, Eoin Colfer, Jody Lynn Nye and Piers Anthony. This week I’ve got four lovely, talented women on the show: Diana Gabaldon, Meg Cabot, Shannon Hale, and Kristin Cashore. We’re going to talk about strong female characters and romantic elements in fiction. 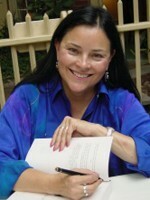 My first guest today is Diana Gabaldon, international bestselling author of the widely popular Outlander series, which are filled with history and time travel. Her first book received the Rita Award for Best Novel from the Romance Writers of America and was also nominated for a Nebula Award from the Science Fiction Writers of America. The Outlander saga has sold over 15 million books and is enjoyed worldwide. Diana and I both live in Arizona, so we bump into each other from time to time. Not only are her books phenomenal, but she’s a pretty cool person herself. I’m so happy to have you on the show today, Diana. Diana Gabaldon: Well, thanks Matthew, I appreciate it. Matthew Peterson: Well, real quick, let’s go back in time for a moment, no pun intended, and let’s talk about the first Outlander book.... A couple years ago you told me why you introduced time travel to your books, and I thought that would be a good way to introduce this. Diana Gabaldon: Sure. Well, to begin with, it was a straight forward historical novel. I was intending to write a book for practice, just to learn how to write a novel. And I said, “What’s the easiest kind of book I could write for practice?” And I said, “Well, maybe a historical novel.” I was a scientist in my previous incarnation, I knew what to do with a library. So, I said, “Fine, historical novel. Where shall I set this?” Well, I was casting around for a good time and place, ‘cause I’d have to look everything up anyway. And I was watching a really old episode of Dr. Who. It was one of the old Patrick Troughton episodes, in which he had picked up a young companion, a Scotsman from 1745, and this was a 17/18 year old kid who appears in his kilt and I said well that’s kind of fetching. So I found myself still thinking about this the next day and I said, “Well, you want to write a book, it doesn’t matter where you set it, the important thing is you pick a point and get started.” So, I said, “Fine, Scotland, 18th century.” And that’s where I began. Diana Gabaldon: And I said, “Well you don’t sound at all like an 18th century person.” So, I fought with her for several pages, trying to beat her into shape and make her talk like a historical person. But she wasn’t having any of it. She just kept making modern remarks. And she also took over and started telling the story herself. And so I said, “Well, I’m not going to fight with you all the way through this book.” I said, “No one’s ever going to see this. It doesn’t matter what bizarre thing I do.” I said, “Go ahead and be modern, I’ll figure out how you got there later.” So it’s all her fault that there is time travel in these books. Matthew Peterson: You know, you write in a very interesting way. You don’t write linear, do you? Matthew Peterson: You just kind of put something here, put something there and put it all together when it’s all done. Diana Gabaldon: Well, that’s just sort of how it works for me. [laughs] I still don’t write with a plot or an outline. But I write where I can see things happening. And I need a kernel, that’s what I call it, to start on any given day. And that’s a very vivid image, a line of dialogue, anything that I can sense concretely. And I’ll write a line or two describing that, as clearly as I can. Matthew Peterson: And these are pretty large books, so you have to make sure that you have everything in mind. Because, I think your last one, A Breath of Snow and Ashes, was, the paperback at least, was like close to 1500 pages. Diana Gabaldon: Oh yeah, well, A Breath of Snow and Ashes and Fiery Cross, the last two, were both pretty close to half a million words. Matthew Peterson: Oh, I’m sure the book stores . . . .
Diana Gabaldon: The amount of what you could effectively bind between covers. Matthew Peterson: I’m sure the book stores had to reinforce their shelves, you know, when they heard you had another one coming. [laughs] But seriously people just consume your books. The Arizona Republic said, “The pages practically turn themselves.” I read that. Diana Gabaldon: Well, you know, if you’re going to write 1500 page books you’d better make them worth while. Matthew Peterson: Yep. Well, the books have evolved over the years. I just can imagine an English woman going back in time and doing these things, but in book three, I thought that was an interesting thing, she does come back to the present and she’s got a little surprise with her, a baby in the oven. [laughs] She has a daughter, Brianna. And there’s more books as well, you have a spin off series, still with one of the main characters. Matthew Peterson: Tell us a little bit about that. Diana Gabaldon: Well, that was actually sort of an accident. I mean those particular books are focused on Lord John Grey, who is a minor, but significant character, through the main serious. Matthew Peterson: And his books are a little bit more like historical murder mystery. Diana Gabaldon: Yeah, they are like historical mysteries. And since of course he’s not a time traveler, you don’t have that supernatural dimension as such. He does have a talent for brushing up against the supernatural, though. But it was the first of those, Lord John and the Hell-Fire Club, that actually started this. Twelve-thirteen years ago I was invited to submit a story for an anthology of historical crime. This was a British anthology. And I said, “Well, I’ve never actually written a short story before, it’s not what you’d call my natural form.” But there were a lot of very eminent mystery writers being invited to take part in this and I said, “Well, I’m very flattered to be included.” And I said, “You know, it would be an interesting technical challenge to see if I could write something less than 300,000 words.” So, I said, “Sure, I’ll do it.” We published it for a while. And I said, “I thought it was a short story.” And they said, “Well it’s not.” So they took it off and sold it to everyone. And all of the publishers, you know, in twenty odd countries all said, “This is great, there’s a Gabaldon book we weren’t expecting and it’s short!” They were thrilled. And they said, “Could she do that again?” Well, being good agents, my agents said, “Oh, I’m sure she could.” And so they gave me a three book contract, you know, to write 2 additional Lord John novels. So, you know, Lord John and the Private Matter, was actually the second Lord John short story. So, bear that in mind as you read it. Matthew Peterson: That is funny. A short story became a book. Diana Gabaldon: So, that’s where that series came from. Matthew Peterson: Well, I think An Echo in the Bone is probably the most anticipated book yet, that you’ve written. At least it is for me. Since we’re finally getting to the Revolutionary War. Tell us a little bit about the main points of the series leading up to An Echo in the Bone, and then tell us, if you can, a little bit about An Echo in the Bone. Diana Gabaldon: Really? Ok, well, let me see if I can synopsize that whole series comprising three million words. [laughs]. Well, to begin with, in Outlander we have this British ex-combat nurse, post WW2 who goes to Scotland with her husband on a second honeymoon. And he’s been in the army 6 years and they’re just getting back together, thinking of starting a family. They’re in this Scottish island, she goes out walking by herself one afternoon and finds a circle of standing stones, which are in fact all over northern Britain, there’s a lot of them. Anyway, she walks through this circle of standing stones and appears back in 1743 where the first person she sees when she emerges from her confusion is a gentlemen in 18th century army officers’ uniform, who looks just like her husband. And turns out, in fact, to be his 6 times great grandfather. He also unfortunately turns out to be a sadistic bisexual pervert. And while attempting to get away from him, she falls into the hands of a gang of Scots, who are also trying to get away from him, for other reasons. Meanwhile Black Jack Randall, her husband’s ancestor is likewise extremely suspicious of this English woman who popped up out of nowhere on his turf, so to speak. He’s insisting that the Scots hand her over and in order to avoid doing this they force her to marry one of the young kinsmen. Because by that token she becomes a Scotswoman and Black Jack Randall has no jurisdiction over her. Well, this would be fine, except that she still wants to get back to the stone circle and her husband, but she also finds herself falling in love with her new husband in the 18th century. Diana Gabaldon: So, you have major conflict going on here. Well the story kind of unrolls from there and continues through five more books after Outlander. At the end of A Breath of Snow and Ashes, we find Jamie and Claire much older in the early days of the American Revolution. Jamie’s illegitimate and unacknowledged son. William, the son, is now 19, he’s a lieutenant in the British army and he’s in the American Colonies. All of these things Jamie knows and of all the things he doesn’t want to happen, he doesn’t want to face his son across the barrel of a gun. And so he’s going to Scotland, and hope things work themselves out in the meantime. So, that’s one of our story lines. If you look at the cover of An Echo in the Bone, you’ll see that thing on the front. That’s a cow trough, which is an ancient military weapon. Romans used to throw them on the ground to cripple horses and enemy cavalry and the current highway patrol still uses them to stop speeding cars, a barricade, you know, throw a handful of those on the ground, it’ll stop anything. Diana Gabaldon: Well, the thing about it, on the cover there, is that it’s got 4 tines as you see each of them ending in a sharp point, well this book has four storylines all of which end in sharp points. One of the storylines is Jamie and Claire as I’ve just described to you. And the second is that of their daughter, Brianna, her husband Roger and their children. And let’s see, the third storyline there is that of Lord John Grey whom we’ve mentioned and his stepson, William, who is of course, Jamie’s illegitimate son. And we’re seeing the American Revolution from the British side, through them. And the fourth storyline belongs to young Ian, Jamie’s nephew. He had a rather interesting tragic past, you know, from being kidnapped by pirates and temporarily enslaved in the West Indies and later adopted by the Mohawk where he married a young woman who then divorced him because he couldn’t give her live children. And so we’ll see him kind of come to terms with his past and we’ll find out what’s going to happen with him in the future. So, anyway, as I say, those four storylines all kind of meld together in the heat of the American Revolution. This book covers 1777 through 1778. Matthew Peterson: And there will be more, won’t there? Diana Gabaldon: Well, there is at least one more book to come after An Echo in the Bone. I do have to get all the way through the American Revolution. Matthew Peterson: ‘Cause in the last book, there was a reference that Claire would die. You know, a newspaper article . . .
Diana Gabaldon: Oh well there was a . . . well that’s kind of a major part of the plot about the Snow and Ashes. In that in a previous book, in fact, in Drums of Autumn, Roger and Brianna, in the present time, find a newspaper clipping stating that there’s been a fire on Fraser’s Ridge and that everyone in the house has perished, you know, both Claire and Jamie. And so that particular newspaper clipping kind of causes complications in plot and volutions throughout. And it’s not through doing that, we’ll see it again in the this book. Matthew Peterson: Yes, oh good! Well, I’m excited for that. I really appreciate you speaking with us. I’ve been speaking with Diana Gabaldon, international bestselling author of the Outlander series, with Echo in the Bone now available. Thank you so much for being on the show today, Diana. Diana Gabaldon: Well, it’s been my pleasure, thanks very much. Matthew Peterson: Okay everyone. Like always, you’ll want to go to www.TheAuthorHour.com after the show and check out the bonus material that got cut from the interview. There’s actually quite a lot of bonus material this week. Don’t go away, international, best selling author, Meg Cabot is coming up next.